Are you looking for a better way to create videos gallery in your WordPress site? In this WordPress beginner tutorial we will show you how you can create video list and add into your WordPress pages or post. You can create video list from popular video sharing websites like YouTube, DailyMotion, Vimeo. With the attractive design and share icons you can get more share and videos on your videos pages or posts. It's very helpful when you are creating a video site or creating pages that hold your videos. It will also help you increase users and pageviews by adding popular social networking share icons below the videos. There are many WordPress Video gallery plugins which you use to add videos to your WordPress. But Video List Manager is one the plugin that can allow you to add videos into your WordPress posts or pages from video sharing sites. This plugin has many features like lightbox, Social icons, Video, Categories and so on. one of the feature that we would love to use is Video Categories which can help you to create a separate category for videos. Creating video list of your WordPress page or posts is very easy, no coding experience required. So you just need to follow below simple steps. 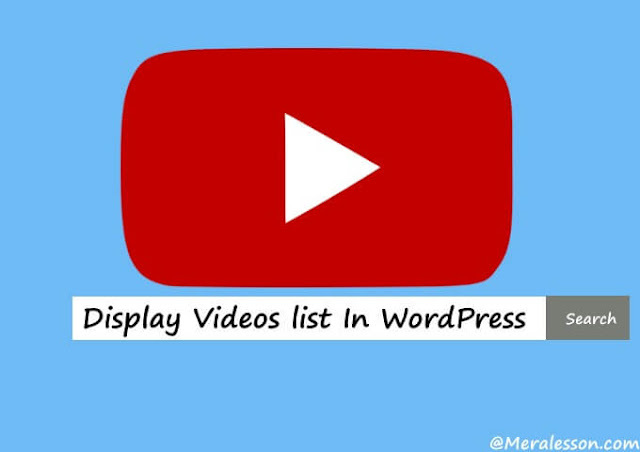 The first thing you need to do is download and install the plugin called Video List Manager through your WordPress plugins interface. If you don't know how to do that then read our step by step guide How to Install WordPress plugins. Once you have downloaded and activated the Video List Manager plugin, then you need to add videos to your site. So You will see the Video Manager tab in your WordPress admin panel, click on that and add new videos. If you want to create a category for your videos then click on add categories and add categories as many as you like. You can change the lightbox skin if you want and also can disable social share button and other options as well. So simply click on video list manager settings tab and from there you can enable and disable the features. 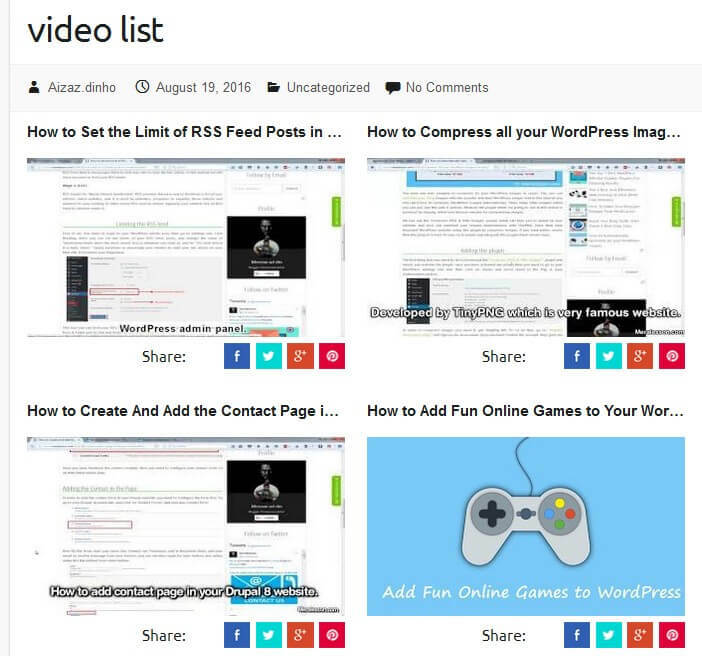 To display Videos list on your page or post you need to copy and paste the shortcode into your WordPress posts or pages. So first copy the below shortcode and paste where you want to display your video list. Col : numbers of column you want to show. Limit : numbers of video you want show per page. 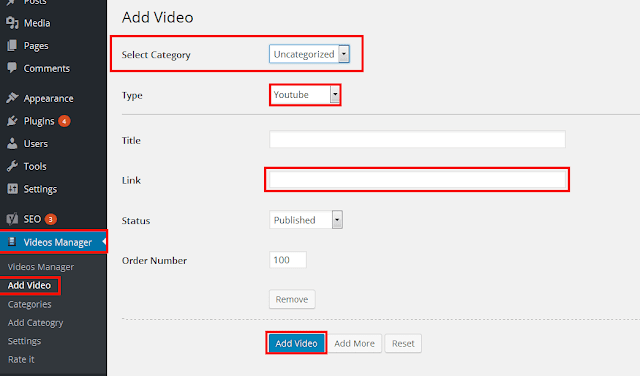 So this how you can create and add videos list in your WordPress site. We hope you may learn from this tutorial if you do then like and follow us on Twitter, Facebook to get latest updates from us.